For a rapidly urbanising Kathmandu, the brick kilns that dot the city's periphery have played an important role in supplying the city with bricks, one of the most commonly used building materials in the country. But these kilns are also one of the major contributors to the city's worsening air quality. 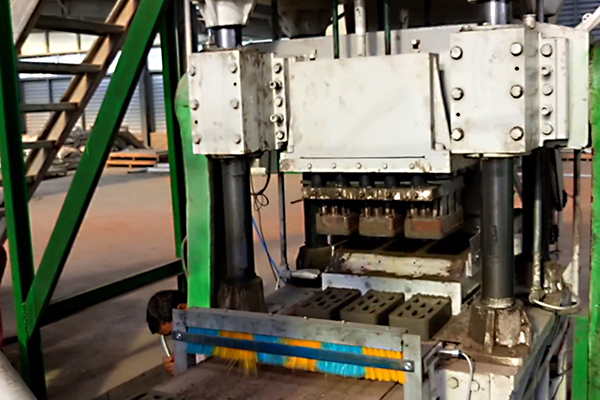 Super Eco Brick Innovations (SEBI), a brick-manufacturing company, which opened its factory in May 2017 and has been manufacturing eco-friendly bricks, however, wants to do things differently. Unlike conventional bricks, the company's bricks are not baked in fire, and their factory does not emit hazardous smoke. The company's bricks are sold under the name SEBI Japanese Bricks. 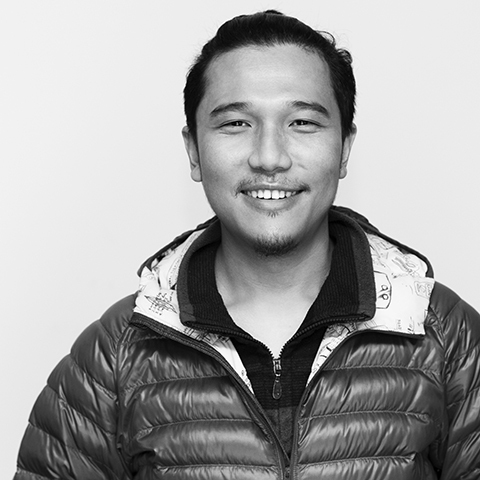 In this Biz Wiz interview, Sunil Lohia, Managing Director of Super Eco Brick Innovations, explains to VMAG's Tsering Ngodup Lama why it's both ethical and practical to start making bricks that do not pollute the environment. When Durga Prasad Sangroulla, who resides in Japan, told me about how a resin catalyst manufactured by the Eiken Company Ltd, Japan (who are now stakeholders in SEBI) could probably be used to make bricks, I was sold on the idea right off the bat. What interested me particularly was that the resin catalyst had never been used to make bricks, and since this was something that had never been done before, I knew I had to see what it was. I soon learned that the resin catalyst would be perfect for mass producing bricks that didn't need to be burnt in fire. Its eco-friendly aspect, I knew, was just what a city like Kathmandu--which has for years had to deal with smoke emitted from conventional brick kilns--needed. For the next few months, I conducted research on everything there was to know about brick making: from the raw materials to the machinery needed for production. Once I had done all that, I designed a comprehensive production-plant plan and came up with the estimated budget. I was so fascinated by the technology and the prospect of mass producing eco-friendly bricks that I invested all my money into this project. Since we still needed more capital, we approached a few people to invest in our idea. Many of them really liked the concept, but when it came to investing, most deemed the idea too new, and backed out. After months of scouting for a location for our factory, we zeroed in on a 100 ropani plot of land in Changunarayan municipality. The location's soil quality, which wasn't very sandy, was just what we needed, and the place's proximity to Kathmandu, our target market, meant less cost for transporting bricks from our factory to customers. But getting the lease of such a large swathe of land was a challenge in itself. It took us six months just to get together the 40 landlords who owned the plot and have the lease agreement signed. Once the lease was secured, we imported high-quality steel structure for the factory from China, and had a Chinese engineer complete the installation process. The first step in our manufacturing process is soil excavation. The excavated soil is then checked for its quality: if the soil is too sandy, we add non-sandy soil to it, and then remove any unwanted elements like grass and plastic. 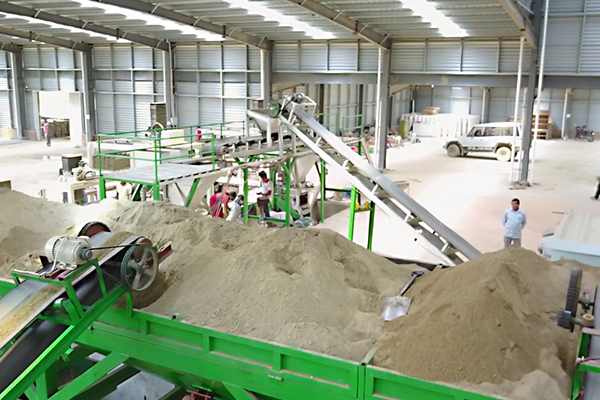 The soil is then processed and made into a powder, after which it is mixed with cement. We only use 53 Grade cement. In the next process, water laced with a resin catalyst, which helps the soil and cement bond, is added to the soil-and-cement mixture--if we are making coloured bricks, we add colour pigments to the water laced with the resin catalyst--and is further mixed in our Planetary fly-cutter mixer. This mixing process takes three to five minutes. All ingredients are mixed in precise proportions. The mixture then goes into our moulding machine, where our bricks are made and compacted using a 400 to 600 tonne force. The bricks are then sent for curing, which is also known as drying. Bricks that are cured for seven days achieve a 7N/mm2 rating (pressure rating) and those that are cured for 30 days achieve 13N/mm2. The majority of the brick kilns in the periphery of Kathmandu use coal to fire up their bricks, and emit a lot of smoke. The smoke from the kilns are one of the major contributors to Kathmandu's worsening air quality. Seeing the need for a better manufacturing process, we decided to start our company--to provide people with eco-friendly bricks that are manufactured ethically. Since our bricks are not fire burnt, our plant doesn't emit plumes of smoke. Another thing that the majority of brick kilns have gained notoriety for is their use of child labour and for animal abuse. We neither employ children, nor do we use animals to ferry bricks. It's important that we succeed because that will encourage others to follow suit, and we hope can help change how brick kilns operate in the country. For any product to survive and thrive in the market, quality is key. In our case, just producing eco-friendly bricks won't do. Our bricks need to be as good as those that are manufactured by traditional brick kilns. When it comes to bricks, strength is one of the key factors. In order to make sure that our bricks have the strength and durability required in construction materials, we conducted the Freeze and Thaw Test for our bricks at the Japan Testing Center for Construction Materials, Japan. During the test, our bricks were placed in 20 degree Celsius water for six hours and then in -20 degree Celsius water for 18 hours. This cycle was repeated for 30 days, and the readings were recorded. 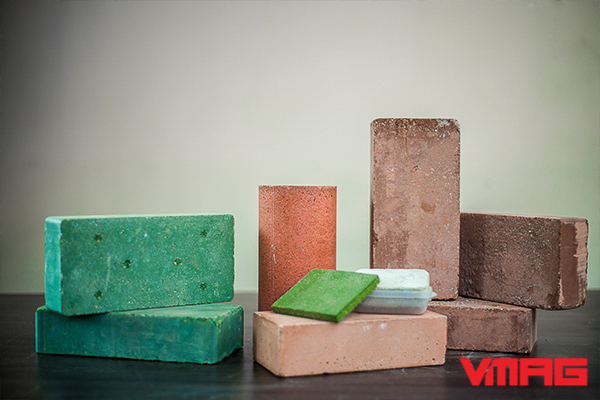 Our bricks have zero efflorescence, zero salt pittance, are uniform in size, are smooth faced and even sized. Since our bricks are not fire burnt, they come in a natural grey colour. But we also provide customers with several colour options: from green and deep red to light red. The price for each brick ranges from Rs 18 to Rs 23. Brick prices vary depending on the colour. Usually, when you order a truckload of bricks, you are charged for 2,000 bricks, but you normally end up getting 100 to 200 fewer bricks. When you order a truckload of bricks from us, you get exactly what you pay for. Since we only make Grade A bricks, customers need not worry about having Grade B and C bricks mixed with their Grade A bricks, a practice many manufacturers are known to indulge in. In a market where only bricks that are burnt are considered strong, we knew selling our bricks wouldn't be easy. We also haven't promoted our bricks extensively, as we are more focused on builders of institutions and so on, who want to use eco-friendly construction materials. For example, Japan International Cooperation Agency (JICA) Nepal and Hazama Ando Construction of Japan are keen to use our bricks in their projects in Nepal. Even though we have supplied our bricks to just a few organisations and individuals, positive word of mouth referrals for our products have already spread in the city, which is very encouraging. We are also relying on similar referrals from our existing customers to dispel the notion that only burnt bricks are strong. For now, we are just focused on our quality, and we'll let the market be the judge. Our immediate plan is to streamline our manufacturing process and make it more efficient. We are also adding new machines in our factory and are looking at producing 100,000 bricks a day. 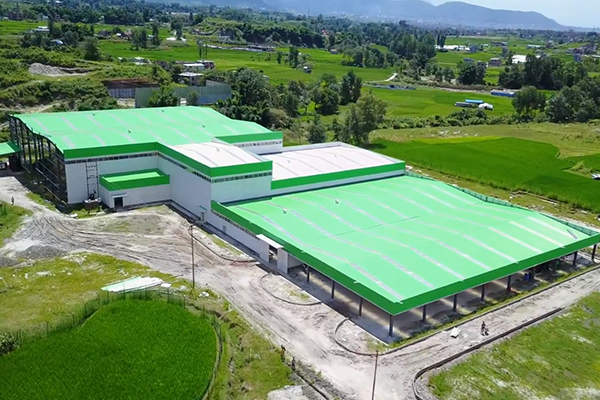 Our long-term plan is to replicate our factory in different parts of Nepal.